So I’m back on the health kick. We are eating healthier meals at least 5 days a week and trying to eat vegetarian 2 days a week. One of those days is almost always tofu. I am a big tofu fan but we mostly have Chili Lime Tofu, Tofu Fries, or BBQ tofu. I don’t have a whole lot of options in the tofu department and sometimes I get bored with it. 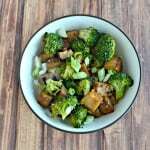 I recently found a recipe for a Korean BBQ Tofu Bowl. The BBQ sauce alone sounded amazing. I almost made the BBQ sauce with the tofu and just served it on top of rice but I wanted the entire bowl the first time I tried it. Turned out that was the best thing I could have done. When I looked at the recipe I was a little concerned because there were a lot of ingredients. I was making the tofu on a Wednesday night so I didn’t want to spend more then an hour in the kitchen. Luckily this recipe only took a little over a half hour to make. The BBQ sauce was amazing. It was a little sweet, a little spicy, and was full of different flavors. It would be great on just plain tofu or even on chicken. Then came the bowl. I made it with sauteed broccoli and peppers, quinoa, and red cabbage. I really liked the quinoa but my husband would have preferred rice. Either way it would have worked. Not only does this dish taste great, it’s pretty too! 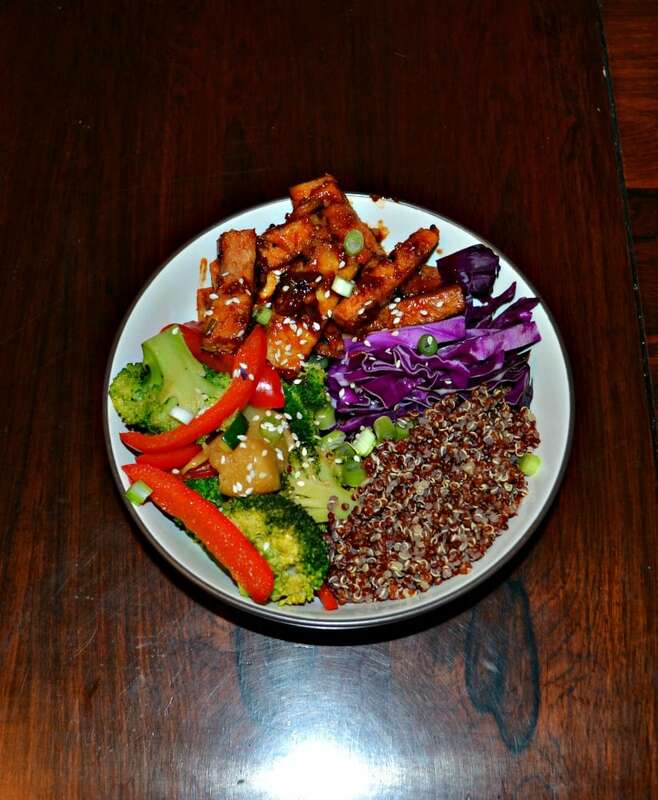 All of the colors in the tofu, vegetables, quinoa, and cabbage really pop in this dish. I liked how the cabbage added a crunch while the quinoa was soft, the tofu was sweet and spicy, and the vegetables were super flavorful. 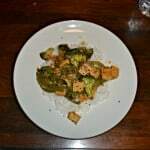 My husband and I both voted this dish two thumbs up and I can’t wait to try it again next time with rice! 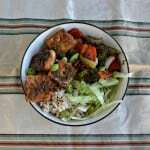 Make this vegetarian entree with a sweet and spicy BBQ Korean tofu, sauteed vegetables, and quinoa for dinner! In a small saucepan combine all the ingredients for the sauce. Bring to a boil over medium high heat then reduce to a simmer. Simmer for 15 minutes, stirring occasionally, or until thickened. Remove from heat. Meanwhile heat 1 teaspoon sesame oil in a large skillet over medium heat. Add broccoli and saute for 2 minutes. Add in the water and cook for 3-4 minutes or until bright green. Add the zucchini, pineapple, red peppers, and soy sauce to the pan. Saute for 5 minutes, stirring occasionally. 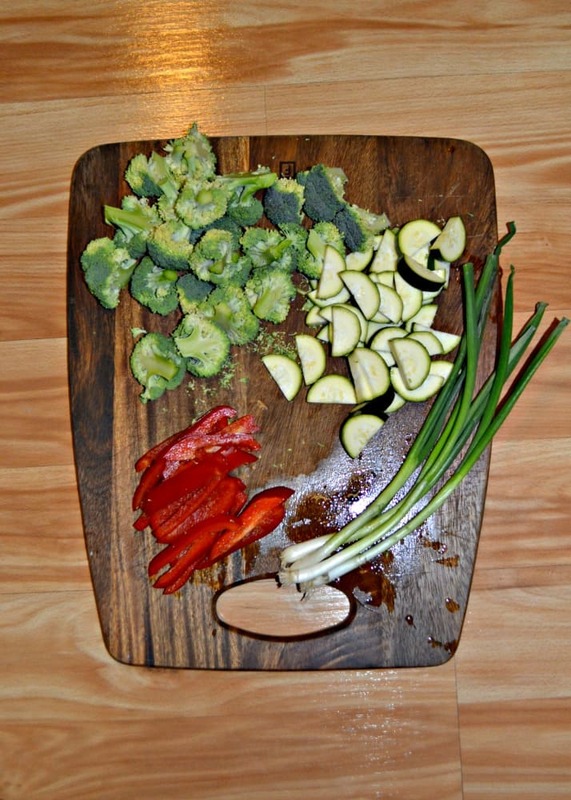 Remove the vegetables from the pan and keep warm. Add the remaining sesame oil to the pan. 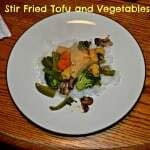 Add the tofu and cook for 8-10 minutes or until browned. 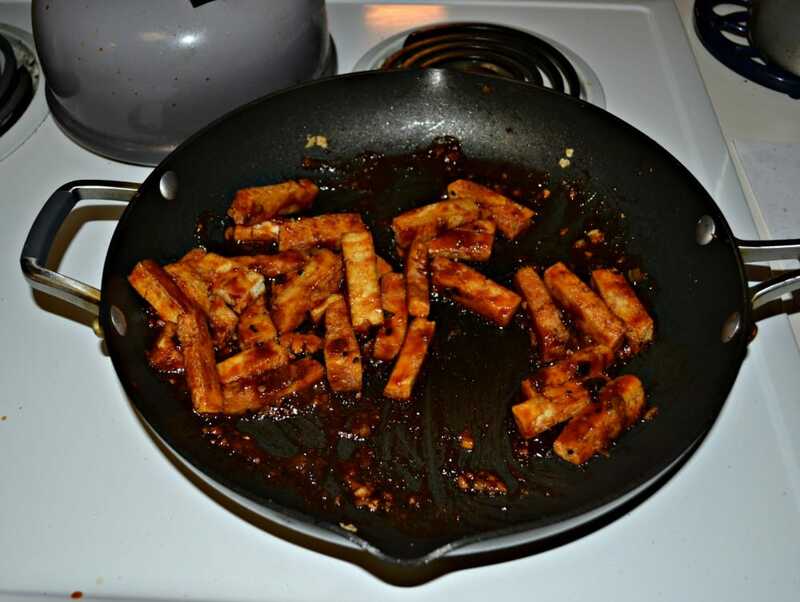 Pour the BBQ sauce over top of the tofu and toss to coat. 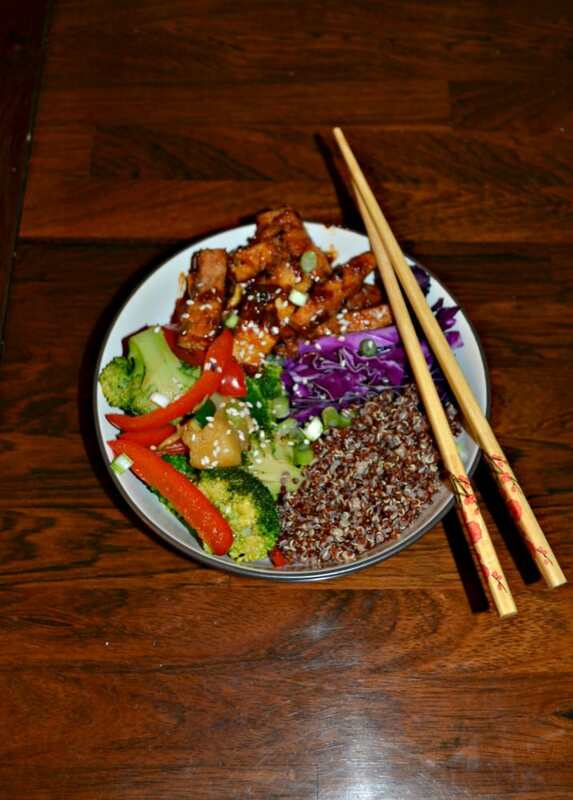 To prepare the tofu bowls place ½ cup of the quinoa in each of 4 bowls. Divide the vegetables between the bowls. Place ¼ c. red cabbage in each bowl. 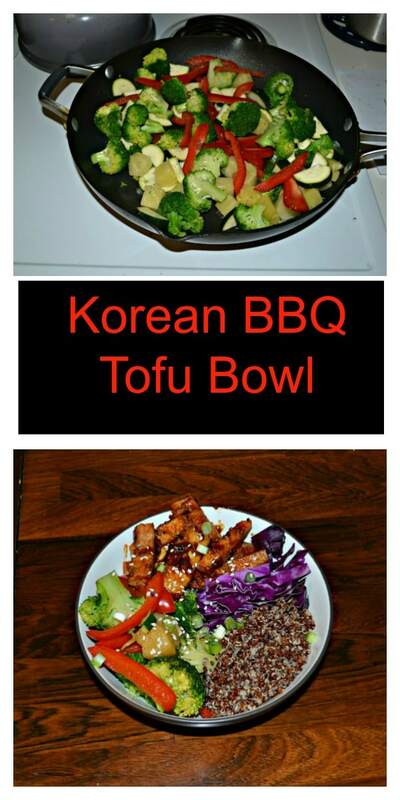 Divide the tofu between the bowls. Sprinkle with green onions and sesame seeds.